Cagney Nowak is writing a novel around the 1905 shooting death of baseball legend Ty Cobb’s father by his mother a week before Ty was called up by the Detroit Tigers. Although she was acquitted by an all-male jury on the grounds that the incident was accidental, the townspeople of Royston, Georgia, thought otherwise. When Cagney begins to relive the night of the shooting in his dreams, more than a century later and in the guise of Amanda Cobb, he is led to discover his father’s deepest secret. 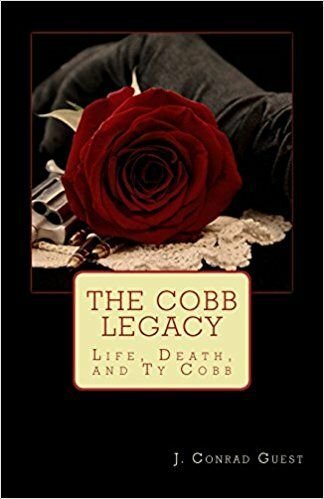 More than a mystery, The Cobb Legacy is the story of a man’s efforts to connect with his dying father, a World War II veteran suffering from Post Traumatic Stress Disorder, and to come to terms with his obsession over the Cobb legacy as well as his own adulterous affair and impending divorce, while doubting that love with an old friend can be his. “I used to think Romeo and Juliet was the greatest love story ever written. But now that I’m middle-aged, I know better. Oh, Romeo certainly thinks he loves his Juliet. Driven by hormones, he unquestionably lusts for her. But if he loves her, it’s a shallow love. You want proof?” Cagney didn’t wait for Dr. Victor to say yay or nay. “Soon after meeting her for the first time, he realizes he forgot to ask her for her name. Can true love be founded upon such shallow acquaintance? I don’t think so. And at the end, when he thinks she’s dead, he finds no comfort in living out the remainder of his life within the paradigm of his love, at least keeping alive the memory of what they had briefly shared, even if it was no more than illusion, or more accurately, hormonal. Cagney heard the leather creak as he shifted his weight in his chair. “Different genders, different generations, different assumptions and rules are revealed in this game of eternal truths played through eternal differences. Chapters switch from Cagney’s flailing present to (Ty) Cobb’s wounded past, linked by the mystery of dreams and the factual numbers of baseball. Figures never lie, thinks Cagney, wondering another time, Ain't it great to be living in America? Land of the free, home of the psychoanalyst. “The Cobb Legacy balances the pursuit of happiness with the choice for happiness, presenting lives wounded by guilt and regret, scarred by lack of communication. The present-day dialog is convincing and absorbing, like sitting in a restaurant listening while strangers meet at the table opposite, half-wondering if they're famous, half-guilty for learning so much about their lives. The recreation of the past is authentic too and nicely interspersed throughout the tale, adding a curiously disconnected depth. Threads come together with gentle touches of fate and there's a satisfying completeness to the tale which goes beyond past and present into eternity.